First Love Missions: What is Replacement Theology? · Re-Writing the Gospel – New Jerusalem as the habitation of the bride of Christ would not exist, re-writing Revelation 21 & 22. Replacement theology (aka supersessionism) essentially teaches that the church has replaced Israel in God’s plan. Adherents of replacement theology believe the Jews are no longer God’s chosen people, and God does not have specific plans for the future nation of Israel - and that the church is a continuation of Israel (replacement/covenant theology), or that the church is completely different and distinct from Israel (dispensationalism/premillennialism). The Jews are more or less forgotten and God has turned His back on Israel. Replacement theology teaches that the church is the replacement for Israel and that the many promises made to Israel in the Bible are fulfilled in the Christian church, not in Israel. So, the prophecies in Scripture concerning the blessing and restoration of Israel to the Promised Land are 'allegorized' into promises of God's blessing for the church. Major problems exist with this view, mainly that it goes directly against the word of God. If Israel has been condemned by God, and there is no future for the Jewish nation, how do we explain the supernatural survival of the Jewish people over the past 2000 years despite the many attempts to destroy them? How do we explain why and how Israel reappeared as a nation in the 20th century after not existing for 1900 years? The view that Israel and the church are different is clearly taught in the New Testament. Biblically speaking, the church is completely different and distinct from Israel, and the two are never to be confused or used interchangeably. We are taught from Scripture that the church is an entirely new creation that came into being on the day of Pentecost and will continue until it is taken to heaven at the rapture (Ephesians 1:9-11; 1 Thessalonians 4:13-17). The church has no relationship to the curses and blessings for Israel. The covenants, promises, and warnings are valid only for Israel. Israel has been temporarily set aside in God's program during these past 2000 years of dispersion. After the rapture God will restore Israel as the primary focus of His plan. The first event at this time is the tribulation (Revelation chapters 6-19). The world will be judged for rejecting Christ, while Israel is prepared through the trials of the great tribulation for the second coming of the Messiah. Then, when Christ does return to the earth, at the end of the tribulation, Israel will be ready to receive Him. The remnant of Israel which survives the tribulation will be saved, and the Lord will establish His kingdom on this earth with Jerusalem as its capital. With Christ reigning as King, Israel will be the leading nation, and representatives from all nations will come to Jerusalem to honor and worship the King—Jesus Christ. The church will return with Christ and will reign with Him for a literal thousand years (Revelation 20:1-5). The following video presents a good explanation of replacement theology from Dr. Ed Hindson. 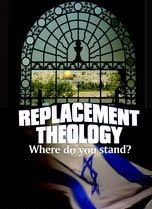 Replacement theology teaches that the church is the replacement for Israel and that the many promises made to Israel in the Bible are fulfilled in the Christian church, not in Israel. So, the prophecies in Scripture concerning the blessing and restoration of Israel to the Promised Land are “spiritualized” or “allegorized” into promises of God's blessing for the church. This is false teaching and blasphemy! First Love Missions is sponsoring another visit from the foremost anti-replacement theology ministry in June, Bishop Dominiquae & Rabbi Baruch Bierman. Please watch for the official announcement soon.